SOUTH BEND, IN – Elkhart Plastics, Inc. (Elkhart) is pleased to announce that Josh Thompson has joined the company as a Staff Accountant. Thompson is based out of the company’s South Bend, Ind., office and responsible for all accounting functions at the Ohio City, Ohio, facility as well as special projects assigned by Elkhart CFO Jon Wyngarden. Thompson previously worked at Elkhart as a summer intern. He recently earned a Bachelor’s of Science in Business with a concentration in accounting from Indiana University – South Bend. In addition to his summer position with Elkhart, Thompson previously worked at Hoosier Racing Tire as a shipping and receiving group lead. He is the first Elkhart intern to be offered a full-time position after finishing a degree. 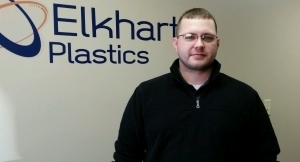 “I am excited to start my career with Elkhart Plastics and look forward to the opportunity to grow within the company,” Thompson said. An avid golfer, Thompson enjoys spending time with family and hitting the course frequently.